In the fall of 2012, the terms “Gauged Porcelain Tiles” and “Gauged Porcelain Panels” didn’t exist yet. Back then, the product was just beginning to show up in the U.S. market and was being referred to as “thin tile.” No one knew how to deal with tiles that were 3´ x 10´, an 1/8˝ to 1/4˝ thick, and somewhat flexible. That fear led many to dismiss thin tile as a fad that would die out if they just ignored it. Others decided to embrace the challenge and introduce the products and techniques from Europe to the U.S. market. The first companies to make significant investments in importing the products and figuring out how to install them were Crossville and MAPEI. In the fall of 2012, these two companies came together to give the first educational session at Total Solutions Plus. To a standing-room-only crowd, the first deck of PowerPoint slides were given that explained how the product was made, how it should be handled in the field, and how it should be installed. MAPEI’s Dan Marvin and Crossville’s Noah Chitty gave a presentation on gauged porcelain tile and panels at Coverings 2018, updating the audience on all the new findings and standards for product and installation of the material. 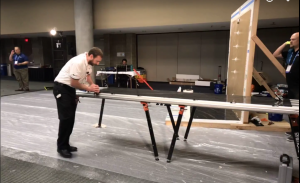 Ryan Freitag with Donnelly Distributing – the US Raimondi distributor – shows the crowd how to use a 10’ long score-and-snap cutter. 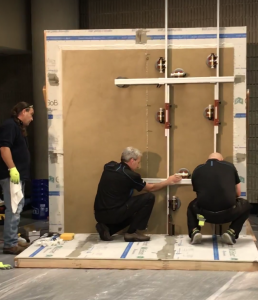 After the PowerPoint portion of the Coverings presentation, there was an added bonus; the entire audience stayed to see a live demonstration of two panels being installed on a wall and one on the floor. With the help of Raimondi (tools) and MLT (lippage tuning devices), the audience was able to see first-hand how the Laminam by Crossville panels are cut, how MAPEI Ultralite S2 mortar was applied to the substrate and the tile with a special trowel, how they are installed with minimal lippage to avoid future damage, and how the air was worked out with the “Cross-walk” method that is now part of the standard. Several attendees came up to do some cuts themselves and see how a 10´ long score-and-snap cutter works. As the audience was told several times, it is much better to make your mistakes on someone else’s 30 sq. ft. tile than one you’ll have to pay for if you mess it up. 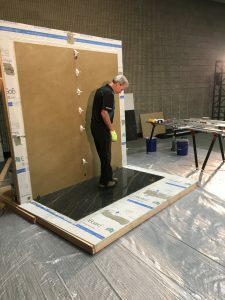 MAPEI’s Gerald Sloan shows how to release air trapped beneath the large thin panels using the Cross-walk method. Back in 2012, most of the audience had never heard of ‘thin tile’ and no hands went up when asked if they had worked with or installed it. 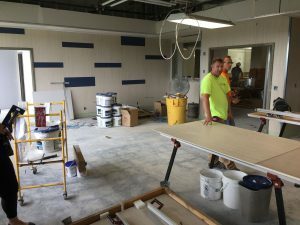 But in 2018, thanks in large part to the educational efforts of Crossville, MAPEI, and Coverings, everyone in attendance was familiar with the product and at least half had seen and worked with it. This year, the audience offered each other solutions to questions based on experience instead of the manufacturers giving solutions based on experimental results. After a very busy afternoon, the group stayed well past the allotted time of 4:30 p.m. to ask follow-up questions, trade business cards, and share war stories. Those installers who have embraced Gauged Porcelain Tile and Gauged Porcelain Panels have found a niche where their craftsmanship can shine. Architects and designers love the minimal grout joints and dramatic styling. Building owners are pleased with the low maintenance and many compliments they receive. As for Noah and Dan, they are simply happy when the last questions are answered, all of the tools are back in their boxes and the next trade show is still a few months away. After the PowerPoint, attendees got to witness an actual wall and floor GPTP installation. More than three decades ago, global tile manufacturers introduced through-body porcelain tile, and it quickly and seemingly became the industry’s cure-all. Being more molecularly compact than typical glazed ceramic tile, it offered the same durability and resistance to moisture, as did solid granite… and, at a lesser price-point. Over the years, porcelain formats morphed into gargantuan tile sizes as large as 36” x 48.” And these tiles were no longer just “through-body” versions. Advanced inkjet printing processes were developed that actually gave the tiles both “looks” and textures resulting in it being almost impossible to discern whether or not they were true natural materials. And, this printing procedure was no flimsy topcoat. Airports around the globe, for example, which have tens of thousands of people racing across their terminal floors pulling wheeled luggage on a daily basis, have been successful with their specification of HD printed, porcelain flooring. So what was next in the world of porcellanato? In the last few years, a new phenomenon has appeared, now termed “gauged porcelain panels.” These are extremely large tile slabs, produced with fine porcelain clay, manufactured to minimal tile thickness without compromising the performance levels inherent to porcelain tile. Visionary architects are specifying this material for a myriad of applications, including to be installed directly over existing tile (which means the arduous, messy, time-consuming and disruptive process of removing ceramic tile can be eliminated), as monolithic-appearing wall applications… and, even to perform as exterior cladding. Relative to vertical installations, one of the few disadvantages of “regular” porcelain tile is weight. 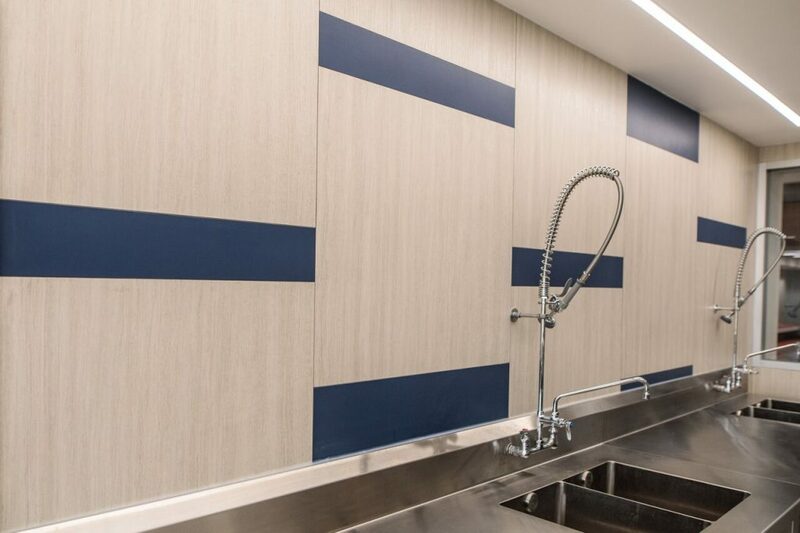 Gauged porcelain panels have become the ideal alternative, because when installed correctly, due to having much lighter weight, various structural components can be reduced… saving a great deal of installation time and out-of-pocket money. A good example of this took place recently at the University of Southern Indiana’s Health & Professions Building. Abell demonstrated how projects calling for gauged porcelain panels could be installed in roughly half the time, even with a smaller crew. 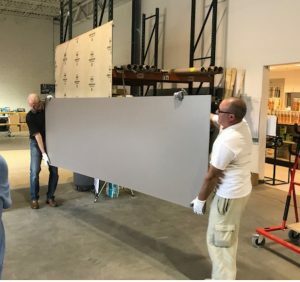 He showed how Bosti-Set™ immediately grabbed porcelain tile panels in a single coat, did not allow any sag, yet made it possible for these panels to be “reposition-able” for at least 30 minutes. “As a business owner, I’m always looking for efficiencies that are timesaving and ultimately, cost saving,” added Fulton. “So ultimately, we decided to work with this newer product. Fulton went on to state that he was so captivated by this project… he actually put on his accountant’s hat and followed every single step to measure the overall savings. “There is no mixing needed with this system,” he mentioned. “It’s just ‘open and go.’ Other systems require a 50 lb. bag of thin-set per panel. This project had 70 panels to install, and I estimated that without mixing, we could roughly save 30 minutes per panel on the installation alone, not to mention the mixing time and chasing water that was completely eliminated. 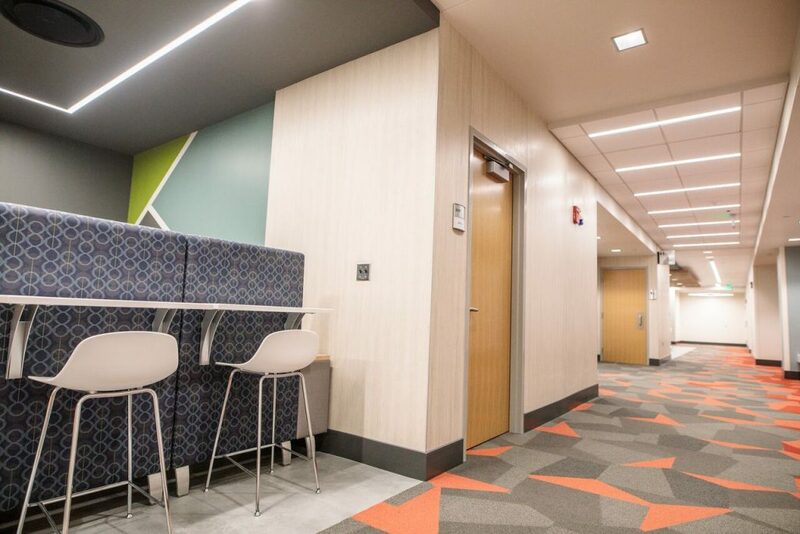 Ultimately, for this 2,500 square foot project, even though Bosti-Set™ is a bit more costly than other products, we may have saved close to $5,000 just by using it. “And, that number is very conservative!” Fulton beamed. Fulton Tile & Stone depends upon its major distributor, Louisville Tile for the great percentage of tile and sundry materials used in the many installations for which the firm is engaged. Don Kincaid, Vice President of Sales & Marketing at Louisville Tile, believes gauged porcelain tile panels have a very, very bright future. “In particular for the commercial sector, these materials are gaining more and more acceptance. Designs calling for gauged porcelain, at this early stage of its existence, most likely are coming from savvy architectural designers who understand it doesn’t just add a monolithic look due to having minimal grout lines. It offers many more solutions, one being because it is so much lighter in weight than natural stone… it can be directly installed on vertical surfaces as a viable alternative. And, because of the realism generated by today’s amazing high-definition inkjet printing processes, very few people will not know the product isn’t an actual stone slab. More than 20 installers came out to learn more about thin gauged porcelain tile panels and the new ANSI 108.19 standards of installation at Belknap White Group’s Woburn, Mass., Solution Center. 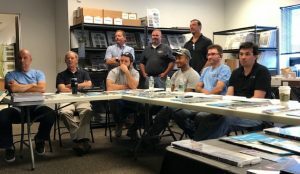 The Belknap White Group (BWG), one of America’s leading full-service flooring distributors and an NTCA associate member, recently hosted a full day of hands-on, classroom style training at its Woburn, Massachusetts, Solution Center. More than 20 installers came out to learn more about thin gauged porcelain tile panels and the new ANSI 108.19 standards of installation in this classroom environment. Representatives from Crossville Inc., LATICRETE International and Montolit Tools were on hand to conduct the training, which leads to attendees being named and listed as qualified panel/slab installers on Crossville’s Laminam website (https://crossvilleinc.com/laminam-by-crossville/) and certified under the new ANSI standards. 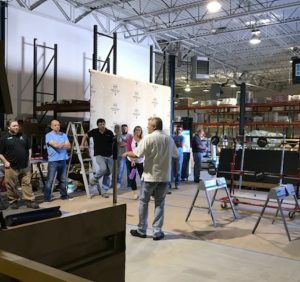 The training event not only taught the origin of Laminam, but attendees were meticulously trained on tools required, how to handle it, how to cut it, appropriate setting materials, work time, and proper installation procedure. 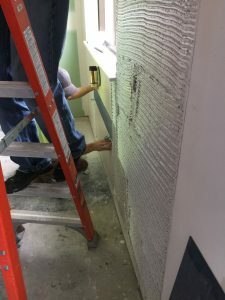 Attendees were meticulously trained on tools required, how to handle Laminam by Crossville gauged porcelain tile panels, how to cut it, appropriate setting materials, work time, and proper installation procedure. The event was well received by attendees, who also enjoyed breakfast, lunch and the opportunity to win fun door prizes, like an iPad, GoPro and Yeti Cooler. Representatives from Crossville Inc., LATICRETE International and Montolit Tools were on hand to conduct the training, which leads to attendees being named and listed as qualified panel/slab installers on Crossville’s Laminam website.